The almighty Laksa King | 15,000kms of Food! The best laksa in Melbourne without a doubt, is at Laksa King. 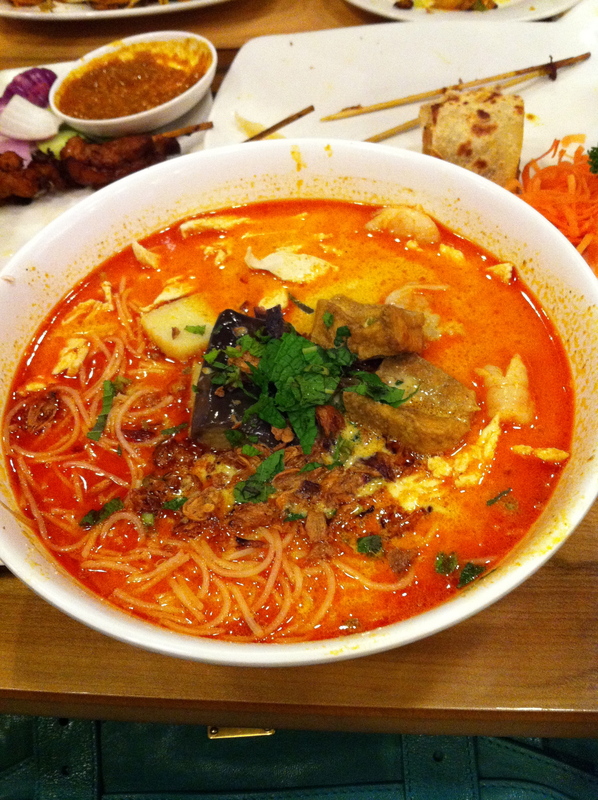 The combination laksa has a great flavour, is loaded with noodles, prawns, chicken, tofu, and is so reasonably priced! Soupy goodness! 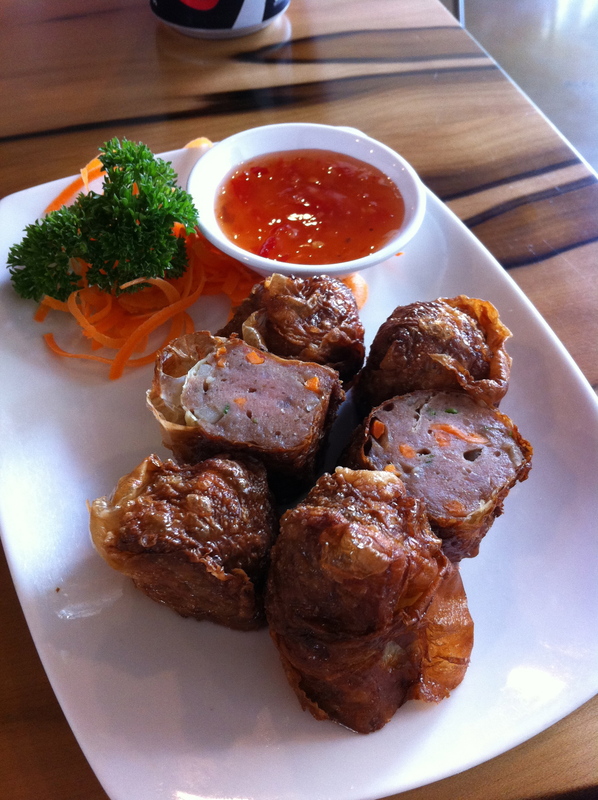 From the entrees, we’ve had the Lobak (pork mince wrapped in tofu skin) and Chicken Satay. 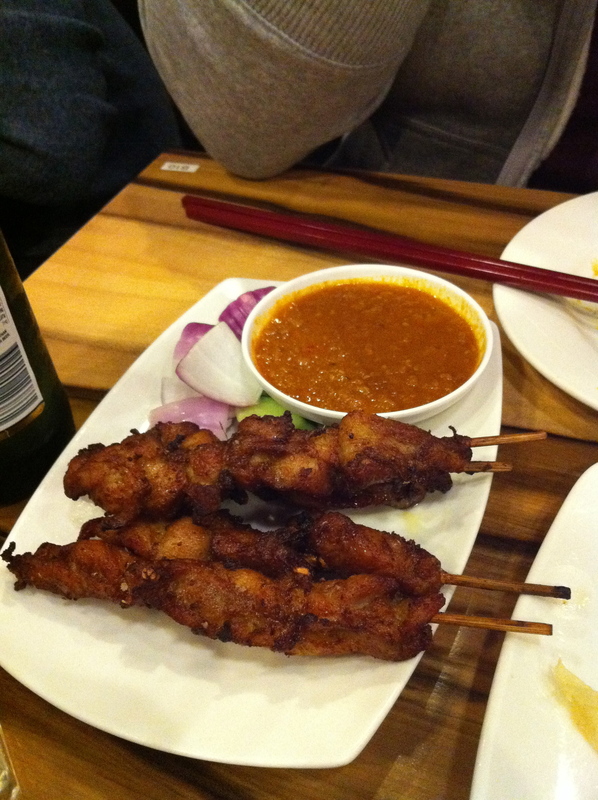 Both are good, with the lobak being deep fried salty goodness, and the satay is delicious with the peanut sauce. If laksa is not your thing, then there’s the old favourite Chow Kuey Teow if that tickles your fancy, or the inventive Laksa King Special Fried Rice which had roast duck and the usual fried rice friendly veges. There are lots of other hawker style dishes to try, such as the Prawn Noodles and Mee Goreng, and lots of dishes to have with rice. 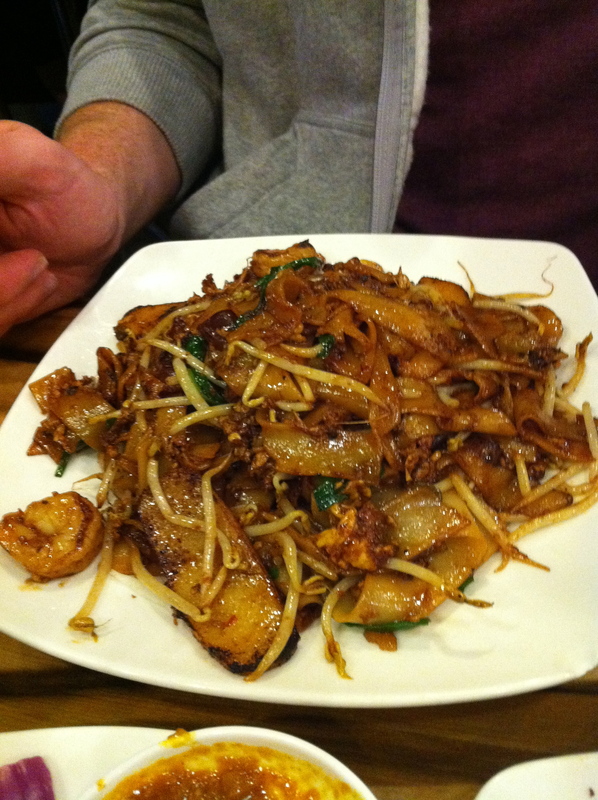 Personally, on the occasions that I do get to Flemington, I stick with the Laksa or the Chow Kuey Teow. Love this place – great value and great food. The serving sizes are maybe a little too generous at times… but sometimes that can be a good thing. All hail the king of the Laksa! 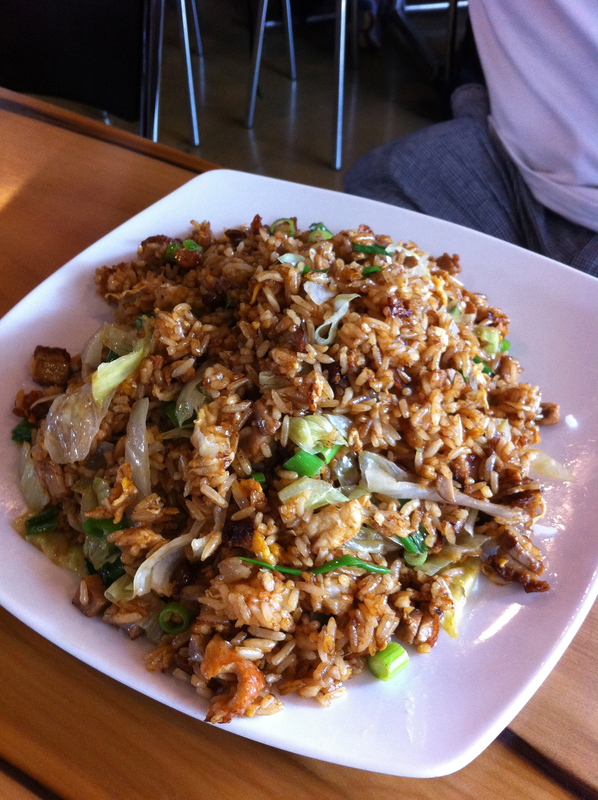 My oh my … awesome place with authentic dishes from Penang and Malaysia. Within 2 days i dined there twice consecutively just before flying back to Singapore on the 2nd day. Born in Penang and lived in many other parts of Malaysia literally, I vouched for the authenticity of Laksa King. The teh tarik was creamy, smooth and moderately thick with the tea aroma. What’s lack is only the visual which is not enough foam and frothiness. Rating: die die must try but ask for more foam. I love the Penang Assam Laksa which comes piping hot and visually all correctly done. The taste of the fish-based gravy was authentic and color was right. My only feedback which Mr esmond Wong took with delight is the sugary sweetness which can be reduced slightly. Rating: die die must try. When the fish-head noodle soup arrived, i was mesmerised by its fragrance. The fish meat was fresh sweet and with the right bouncy texture when bitten. In fact, i dried up the bowl & told Mr Wong, “No need to wash my bowl”. It’s even better tha the famous one in Singapore at Ang Mor Kio. Rating: die die must try. Then, came the fish-head curry cooked Malaysian style. Boy, this is heavenly sinful. The spiciness is just right though I bite chili padis for snacks. The freshness of the fish, the veges and the gravy are all unspeakably delicious. I even doggy bag home to keep overnight so as to dip French baguette or rolls for the next day. Rating: die die must try. Last but not least, is the Ipoh Sar Hor Fun. Superduper yummilicious! I like the charred hor fun noodle which gave such a good nostalgia when i sank my teeth into them. The big prawns, chunky fish fillet and fresh bright green chye sim all add into the joy of eating this dish. Oyes, don’t forget the gravy: it’s perfectly done with the right texture, tasty and viscosity. Rating: die die must try. My salute to Mr Esmond Wong, his wife and all the efficient and courteous waiters & waitresses especially Jun and Lily respectively. Thanks so much for the review! I’ll definitely have to try the fish head noodle soup and ipoh war for fun – if I can get past ordering the laksa or chow keuy teow!